Because I had the motorbike and plenty of petrol I could get to Ingas any time – it was about 100 kilometres and took me a couple of hours. After a couple weeks I did so to visit, the factory was in full production. I had a good assistant manager and was not missed till I was on the way to Germany when they rang looking for me, so I just disappeared. To leave for Germany we first went to Dizgaili about 20 kilometres from Liepaja. It was Adis (Milda’s brother) mother-in-law’s farm. From Ingas we packed a horse cart for each family – Millers, Zanis Lemchens, us, and a labourer came with us to return the horses and carts. A: Ingas’ grandmother refused to leave, her daughter Constance was a chronic TB patient and was considered unfit to travel. 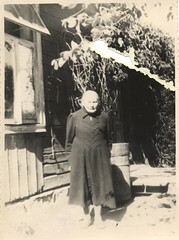 Also, she felt she had to stay and wait for Adis and his family to return from Siberia. She was sure that the Russians would not touch her as she was too old – however both she and Constance were sent to Siberia to the salt mines. Constance died there but grandmother returned to Latvia. Adis children, Janis and Marite and their mother also returned. The road was a constant traffic of refugees like us and the retreating army; horse carts and motorised traffic mixed up. A few times, Russian planes came over and machine-gunned the road. You stopped and dived in the deep ditches on the side of the road. I don’t remember any people being killed, but did see dead horses by the side of the road. In Liepaja, we stayed at a roadhouse and by paying in bacon the landlady gave her room for Milda and the children. The men had to sleep on the wagons to protect them. In the morning before we went to see about getting on a ship, a man from one of the houses open to the courtyard where we had our horses came out swearing and calling our families names. Zanis, without saying a word, hit him across the face, the man fell backwards and as he got up Zanis repeated it, the man apologised saying he would not call him anything but sir. We had to wait a few days for the papers to be arranged (this was done by a cousin who was in a position to help,) everybody was eligible to go and there was nothing to pay. While waiting, I met a very good friend from Kuldiga, Skujins, he tried to persuade me not to go to Germany but to stay and save the “fatherland” after sending the wives and children to Germany. He was involved with an interim government formed at Liepaja, the real one having disintegrated. I said I was going. This was in 1944. Skujins stayed behind and afterwards I heard the sad story of what happened to him. As the Russians advanced all escape was closed and Skujins and the people from the interim government were trying to make their way through the forests along the coast with a view of getting to Sweden. As his group were crossing a road in a gully they were surprised by a Russian patrol and Skujins was shot in the stomach. He was carried to a barn, but as there were no medical facilities he shot himself. He was buried in the forest. The story was told by one of his group who managed to get to Sweden. To board the ship, only the things you could carry were sure to get there. So we all dressed with many layers of clothing like two suits. The cans of butter and bacon, which were most valuable, we hung around the neck – half choking in the process, suitcases in each hand. One of the young sailors grabbed Ruta, aged 3, under one arm and a suitcase in the other and went straight up the gangplank, which was very narrow, with a rope on one side only. The German sailors were very kind to children. My grandfather was Krisjanis Bandenieks, from the same area. Might they be related? Copyright © 2019 Aija Moon. All rights reserved.